Why so serious? The main message of this kooky 5 reel slots online is to let go, have a good time and realise that life’s about having fun. There will be an absolutely neighed chance of you coming away from this game downhearted with loads of free spins and a huge 9500 coin jackpot on offer. Combine horses, cowboy hats, and cowboy boots to win big in Horsing about, the perfect online slot. If not, you might want to play casino slots online different from this game. Established in 1997 in Brisbane, Australia, Eyecon has become a premium software developer in the online casino industry. They make games that players love, be it scratch cards to online slot games, Eyecon has it all. They believe that when you love something, you’ll keep coming back for more, and if you’ve ever played an Eyecon game, you’ll know exactly what they’re talking about. Eyecon boasts a range of exciting games that include the likes of 99 Time, Autumn Gold, and Aztec Rising. Have you ever wondered what it would be like to be a horse? For some of you, it’s probably never crossed your mind, but for a lot of you, you’re certainly nodding in approval. What could be better than doing nothing all day other than walking around a field, or racing, or pulling carts. The answer is a lot of things. Nevertheless, best slots such as this transport you into the mind of a horse and is about as close as you’re going to get to become one so it’s well worth a deposit. As you’d guess from the name, Horsing About has a very equine theme. With 5 reels and 25 paylines, the reels are packed with cowboy hats, lucky horseshoes, a saddle and riding boots. There are plenty of ways to win additional bonus features too which makes this game worth sticking around for. The special symbols to look out for are the Cowboy Hat which acts as your Wild, and the Horseshoe symbol which is the Scatter. As you’d expect, the Wild can substitute all other symbols except the Scatter when it appears on the payline and it will double all your wins and prizes. The maximum prize is also paid out when you spin 5 Cowboy Hats across any winning payline. 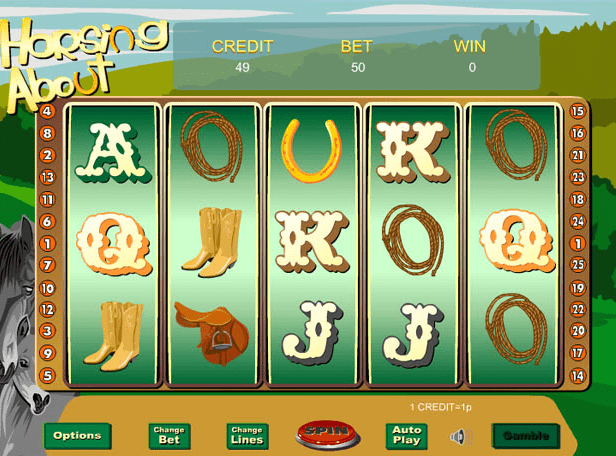 The Horseshoe Scatter symbol will trigger your Free Spins round within this game. If you’re lucky and manage to spin 3 or more Horseshoes across your reels you’ll win your Free Spins and these can be retriggered inside the bonus round. This game is very simple to navigate, and with just 5 reels and 25 paylines to spin means that you are more likely to hit the massive 9, 500 maximum coin jackpot. The main feature to this online slot game is its Free Spin bonus, so make sure to use them up ensuring you get all your coins. The equestrian theme to this game guarantees a lot of fun and quirkiness to the reels. The graphics and sound effects in Horsing About really contribute to an atmosphere that suggests a wealth of money will be coming your way. As is typical of Eyecon games, this online slot is simple and easy to play making it incredibly user-friendly. Remember, there is nothing to take seriously when you’re horsing about and what better way than to lose yourself in a fun themed game with an impressive jackpot on offer. If you fancy an entirely different theme then why not try our jimi hendrix slot?